Case 2. G.D. is a 38 year old male with a 4 year history of lower back pain progressing to severe pain over the 2 months prior to diagnosis. He had diminished pin prick sensation in his feet on both sides. MRI scan showed an ovoid intradural "enhancing" mass at the L3 and L4 levels. There was a smaller "enhancing" lesion one (1) Vertebral segment below the larger one. Figure 1(Left): MRI Scan (Gadolinium Enhanced-Sagittal View) The "primary" tumor (Horizontal Arrow) proved to be a FILUM TERMINALE MYXOPAPILLARY EPENDYMOMA. There is a "second" lesion (Up-curved Arrow) that was a "drop metastasis". 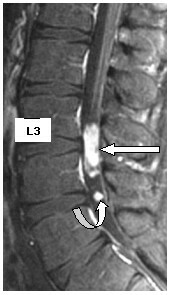 Figure 2A (Bottom Left): MRI Scan (Gadolinium Enhanced-Axial View-Same Patient) The image is the L3,4 Disc Space Level. The Tumor (Arrow) occupies the majority of the intradural space within the Spinal Canal. The surgery consisted of a Minimally Invasive Microsurgical Bilateral L3 and L4 Laminectomy using a Unilateral (one sided) Approach. The tumor proved to be a Myxopapillary Ependymoma that had "invaded" the Pia Arachnoid (the membrane directly adherent to the Nerve Root) of many Nerve Roots making a complete and total resection impossible, without sacrificing the major Nerve Roots. The vast majority (over 98 per cent) of the large tumor was removed. Figure 3A (Left): Operative Photo. The Minimally Invasive "Retractor" is in position through a relatively short vertical incision located just to the Left of the mid-line. Because of the considerable size of this patient, the "retractor" required was 8 centimeters in length. Figure 4: Operative Photo (Same Patient) The majority of the tumor has been removed. The previously compressed Nerve Roots (Horizontal Arrow) are no longer under pressure. A piece of tumor (Up-curved Arrow) remains under an exiting Nerve Root. The edges of the Dura Mater (Vertical Arrows) are now clearly seen. 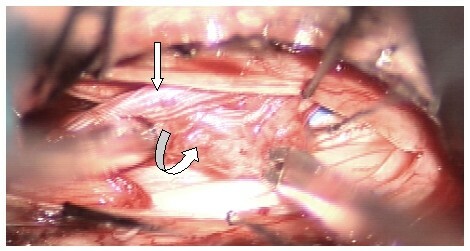 Figure 5: Operative Photo (Same Patient) The tumor (Up-curved Arrow) that underlies the exiting Nerve Root (Vertical Arrow) is being removed with a microsurgical instrument. Figure 6: Operative photo (Same Patient) The remaining remnant of tumor (seen in Figure 5) was removed. The irregular appearance of the surface (Oblique Arrows) of this Nerve Root indicates that the tumor had infiltrated the covering (Pia Mater) of the Nerve Root. This meant that the tumor could not be entirely removed without removing the Nerve Root which would have resulted in a severe additional neurological deficit. 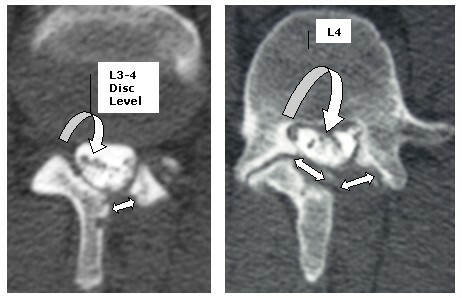 Figure 7A (Left): Post-myelographic CT Scan at the L3-4 Disc Space Level (Same Patient) at 1 year post-operative. The Nerve Roots (the small "black dots" within the Spinal Canal) are clearly identified; however, there is some "clumping" together (Down-curved Arrow indicates the adherence) of some of the Nerve Roots. The Minimally Invasive Laminectomy approach is indicated by the Double-ended Arrow. Although Radiation Therapy (to include the smaller more distal "seeded" tumor as well) was offered to this patient, he chose to be treated with Chemotherapy alone. The primary chemotherapeutic agent used by our Neuro-oncologist (for this patient) was Temodar. He also had a short course of Avastin. Both were well tolerated. The patient continues to have some residual pain in his leg that is well managed by medication. He is followed with Neuroimaging studies and Neurological examinations at regular intervals.